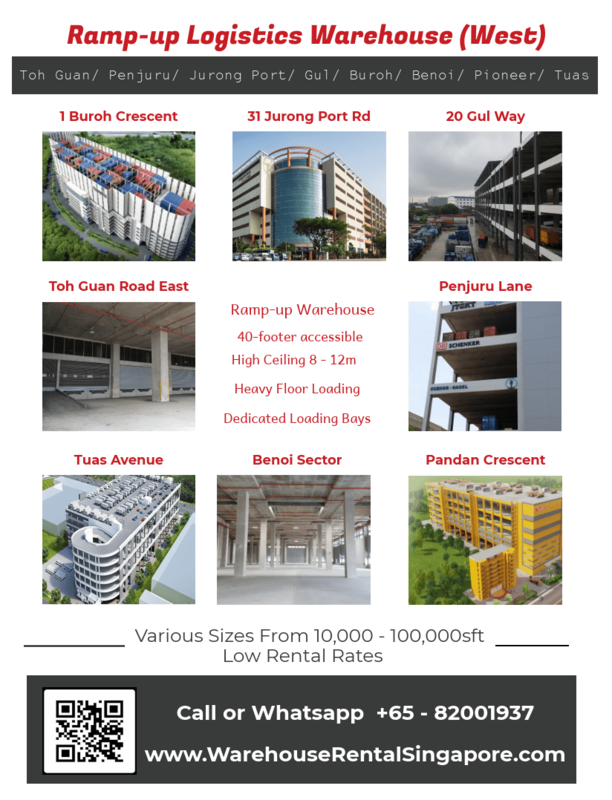 Ramp-up logistics warehouse for rent can be found more in the West area of Singapore (Jurong Port / Pandan / Penjuru / Benoi / Pioneer / Gul / Tuas) compared to the East side. This buildings typically cater for big warehouse size from 10,000 – 100,000 sft . They are mostly favored by logistics and distribution company because of dedicated loading bays to ease incoming and outgoing goods movement. Apart from having high ceiling of 7 – 12m and heavy floor loading of 20 – 25kN/m2, this ramp-up logistics warehouse mostly can cater to 20/40-footer container access. Please call 82001937 to discuss your warehouse for rental requirement. B2 Zone, Logistics Warehouse, Ramp-up.